Supports up to 768 MB or SDRAM using three 168-pin DIMMs. 2 PCI, 1 ISA, 2 USB, 1 Serial, 1 Parallel and 1 MIDI port. SiS530 Built-in 64-bit 3D v1.0 AGP Graphics accelerator which shares up to 8 MB of main system memory to act as a frame buffer. Built-in C-Media CMI8738 3D surround sound system with 24-bit digital audio interface and 44 kHz sample rate. Built-in hardware monitoring circuitry for monitoring cooling FAN RPMs, CPU temperature and operating voltages. 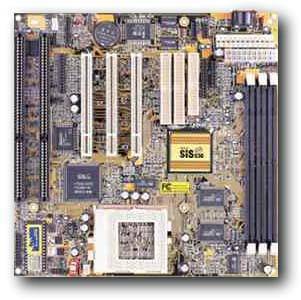 Supports Intel P54C/P55C (MMX), Cyrix/IBM 6x86L, 6x86MX, 6x86MII, AMD K6, K6-II, K6-III, and IDT (WinChip) C6 CPUs. Supports CPU BUS frequencies 60/66/75/83/95 and 100MHz. Provides CPU Plug and Play feature for faster and easier CPU installation. Provides (3) 168-pin DIMM slots for 3.3v SDRAM memory modules. Supports both 1-bit ECC (Error Correcting Code) and non-ECC memory. Onboard 64-bit 1MB/2MB L2 cache (optional). (3) 32-bit PCI expansion slots. (2) 8/16-bit ISA expansion slots. Supports PIO (programmable Input/Output) and BUS mastering. Onboard 64-bit 3D VGA graphics accelerator. 64-bit GUI accelerator with excellent video playback. Up to 8MB frame buffer. The video system shares a specified amount of main memory to work as video RAM. HRTF 3D positional audio, supports both Direct Sound 3D and A3d interfaces. Drivers support Windows 3.1/95/98/NT 4.0/2000 and Linux. Built-in 32 ohm earphone buffer and 3D Surround. Downloadable Wave-table synthesizer support Direct Music. SPDIF Digital audio interface with 24-bit stereo 44KHz input and output with 120dB audio quality. Stereo Mixer supports analog mixing from CD-Audio, Line-In, and digital mixing from voice, FM/Wave-table and digital CD-Audio. (1) Floppy drive controller with 1 Mb/s transfer rate. (2) Serial ports with 16550 compatible fast UART. (1) Parallel port with EPP and ECP capabilities. Detects CPU temperature, Fan speed and motherboard voltages. 2MB Flash ROM supports complete ACPI and legacy PMU and is fully compatible with PC97 and PC98. BIOS provides Plug And Play function which detects the peripheral devices and expansion cards automatically. Includes built-in anti virus software provided by Trend ChipAway Anti Virus which protects the entire boot process. AMI Desktop Client Manager (ADCM) monitors system temperature and voltages via network connection. PC Cillin98 (OEM) provides automatic virus protection for Windows 95/98 and the Internet.